Do a search on Flickr, and you will find countless images of water, milk, and every other liquid you can think of dropping onto or into other liquids or objects. It looks like fun, looks mighty impressive, and looks like an expensive setup. But with a little know how, and a few basic photo tools, you too can be shooting milk splashes in your kitchen at home! So. How do you go about getting a shot, or series of shots like this? Well this is High Speed Photography. You are catching the moment the milk drop hits the surface and causes a splash. To capture this you generally need a fast shutter speed, upwards of 1/1000th of a second. To insure the droplets are captured sharp and in focus you are better raising this to above 1/2000th of a second and make sure you are shooting with a fairly decent aperture, I shot mine at f/8 to get the whole splash in focus. I used my Nikon 105mm Macro for this shot, so I could get close enough to fill the frame with the resulting splash. This sounds all pretty straight forward until you setup your camera, set your shutter speed at 1/2000th of a second, aperture at f/8 and realize that all you get is a black screen. To get a usable exposure at these settings you need light, and a hell of a lot of it. The answer? Flash Lighting. The fastest flash sync speed for a SB900 strobe on my D2x is 1/250th of a sec (not including the High Speed sync option). But your thinking to yourself, we need 1/2000th of a second . . . . . Well we can do even better. This is where a little knowledge of your flash and a touch of trickery comes into play. I manually set my flash to output 1/16th power. And at this power level the flash duration is, ready for it, 1/10,000th of a second! Yes you read that correctly 1/10,000th of a second. That is 5 times faster then the 1/2000th of a second we were trying to achieve! Remarkable. Now its just an easy step to set my camera on f/8 and 1/250th of a second, the combination of which kills all ambient light in the room (if your room is fairly dim all ready). Your exposure then is a combination of 1/10,000th of a second of light from your flash, with the remaining exposure being black. It is in that 1/10,00th of a second that we are going to capture the instant the milk drop hits the surface. Ok, now we are through the technical side of things, there are several ways to trigger the camera to get the moment of impact. The best way, and most accurate way is using a high speed trigger. These are electronic devices that trigger your shutter on a cue. These can be triggered by sound, pressure or braking a light beam. With a custom delay, this can be set to capture the exact moment the droplet hits the surface. There are many triggers available on Ebay, and other sites, Just Google “High Speed Trigger.” Unfortunately my trigger that my Dad built for me is home in Australia, so I just used the 5 frames a second my camera can shoot at and held the shutter down! This works, all though it is a lot more hit and miss, and be prepared to look through hundreds of rejects to find that “Perfect Splash”. So you have your triggering method worked out, you know that with your flash you can capture the moment. Lighting is everything. Unless you light the scene well, all you will get is a drop splashing, that after the initial “Wow, look what I did” moment, is just a drop splashing. 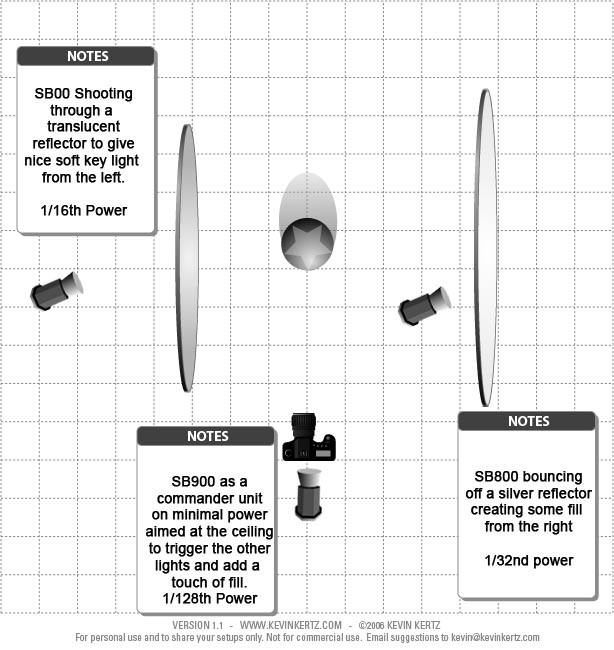 Here is a lighting diagram of my shot. I used 3 lights for this photo as you can see above. My first light was an SB900 on the camera pointing straight up at the ceiling. This light was on minimal power at 1/128th of a second basically just being used to trigger the other 2 lights, while adding a minimal amount of top fill. My key light was off to the left, another SB900 shooting through a diffusion panel to soften the light and give it a nice wrap effect around the droplets. This flash was set to 1/16th power. At this power level recharge time was so little that I could easily shoot off 7 or 8 frames with no delay for recharging, which is more than I needed. My 3rd light was a SB800 set on 1/32nd power and bouncing off of a silver reflector which gave a bit of zing to the fill light coming from the right. This is basically it. I used an eye dropper taped to a stand to deliver the milk. This meant that the drop would consistently land in the same place, so I could pre focus the camera on the target spot and know that my focus would be spot on. You can experiment with the height of the drop, which gives different effects, along with the surface the drop is landing on. Literally countless variations and options to keep you happy for hours! Next Post Join the Military?